Talk about a transformation! St. Thomas, U.S. Virgin Islands’-based captain Oriel Blake grew up inland, between rural Sussex and London in the UK, where she studied anthropology at the University of London’s School of Oriental and African Studies. It looked like Blake’s life would surely be land-based until she and her family took a Sunsail flotilla sail to Turkey during the university’s summer holiday. After that, there was no looking or going back. Blake replaced anthropology with her captain’s qualifications, and lived and worked solidly at sea for the next decade. Today, Blake is still at the helm, although that helm has changed in an exciting way recently. 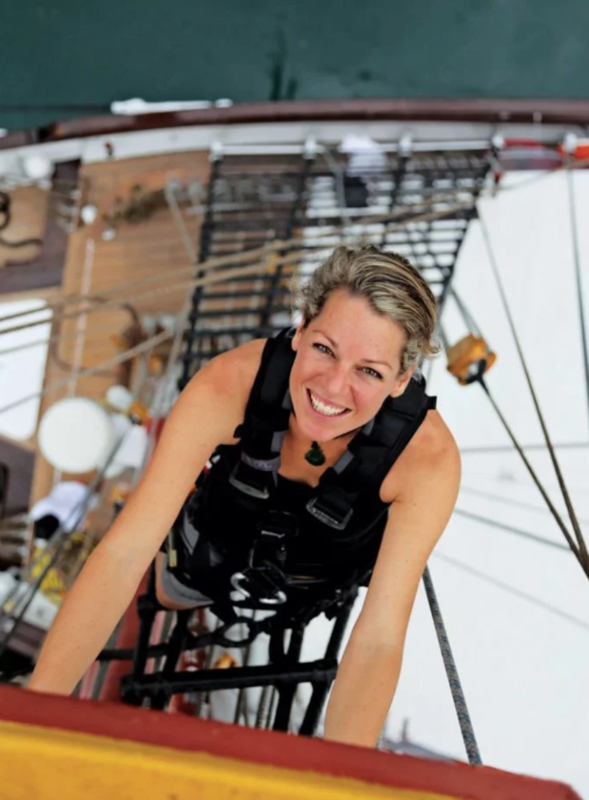 “My father was put out that I’d pushed aside a degree for this new-found sailing ‘career’, so I made certain that he trusted my decision by working steadily up the RYA (Royal Yachting Association) sailing certification ladder through to RYA/MCA Yachtmaster Ocean 200-ton and Yachtmaster Instructor (sail),” she says. Blake has crewed and captained in the Mediterranean, Caribbean and Asia. 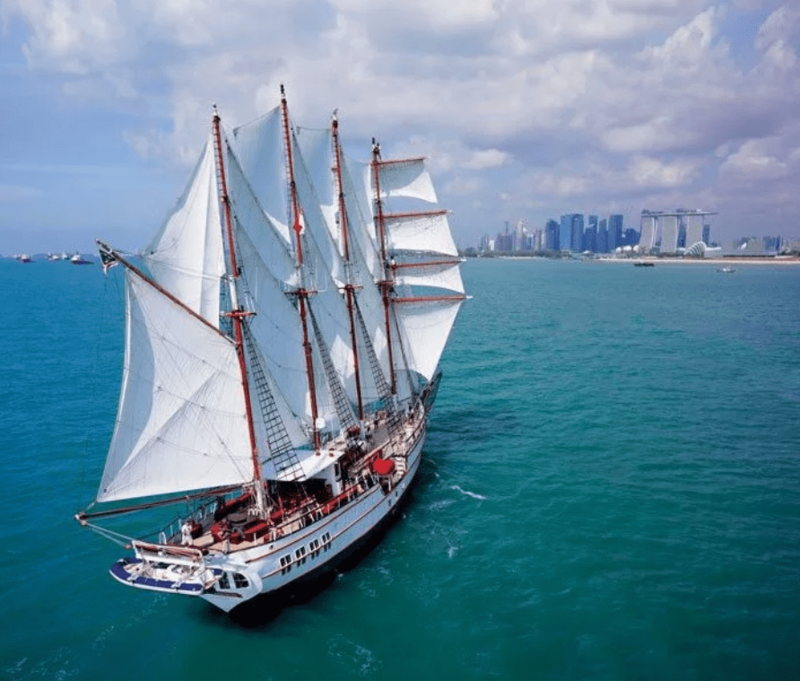 She expeditioned a return winter trip from the UK to North Africa on a J24, sailed from Cape Town to Brazil on a 43ft foot steel expedition vessel, and circumnavigated the Indonesia archipelago on a 72ft wooden schooner. From mono-hull to catamaran, performance classic J-Class to tall ship, she has loved them all. However, her most recent assignment was also her most demanding and her favorite. As chief officer on the Royal Albatross, a 150-foot four-masted barquentine, she managed a crew of twelve navigating and sailing (22 sails!) between Thailand, Indonesia and Singapore. To complement the owner, who was a dive enthusiast, Blake became a PADI scuba instructor and qualified the crew and owner’s guests. Working with an ex-Royal Navy Captain, she was driven, trained and mentored, and became the first woman to be awarded the Nautical Institute’s square-rig endorsement on her Yachtmaster Ocean certificate. For 2018, Blake’s goals for VIPCA are to develop membership benefits to include more marine vendor discounts documented in a VI Marine Directory; work with the Spanish Virgin Islands to provide freedom to charter between the territories; work with the BVIs to improve the status of fees; provide international marketing for the VI charter industry; track VI youth into the marine industry by providing apprenticeships and scholarships; and to develop transient mooring buoy fields in the territory to promote the cruising grounds. What are Blake’s recommendations for those who’d like to follow in her footsteps?